Double-jobbing Tory MP Douglas Ross has been warned by his employer the SFA over his call for a crackdown on gypsy travellers – despite Ruth Davidson’s refusal to discipline the MP. The SFA has joined the Boys’ Brigade in taking a firmer line on prejudice than Ruth Davidson’s Tories, after the Boys’ Brigade disciplined Tory councillor Alastair Majury following his derogatory remarks about Catholics – only for the Tories to readmit him to the party after a short suspension. When asked in an interview what his priority would be if Prime Minister for a day, Douglas Ross answered “tougher enforcement against Gypsies and Travellers”. He was criticised for his remarks by Amnesty International. Now the SFA have warned Mr Ross that he should “give careful regard to the association’s rules while under its jurisdiction” and warned the MP about his use of language. “Part-time politician Douglas Ross has been a constant embarrassment to Ruth Davidson since being elected – choosing to run the line at football matches instead of turning up for his parliamentary duties. “But now it seems the SFA take his offensive and divisive comments about gypsy travellers more seriously than the Tory party. 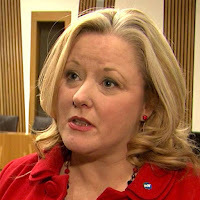 “This is beginning to look like a pattern – with the Boys’ Brigade taking more serious action than the Tories over their disgraced councillor Alastair Majury and his sectarian tweets.